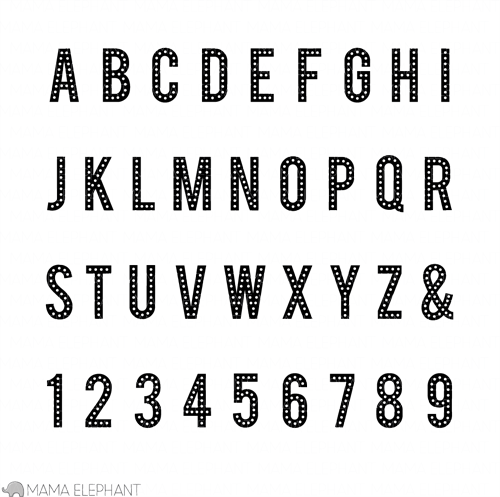 mama elephant | design blog: April Stampede and Release! 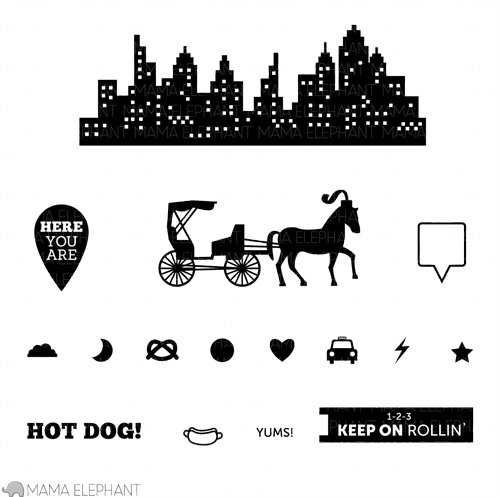 Welcome to the Mama Elephant April Design Team blog hop! 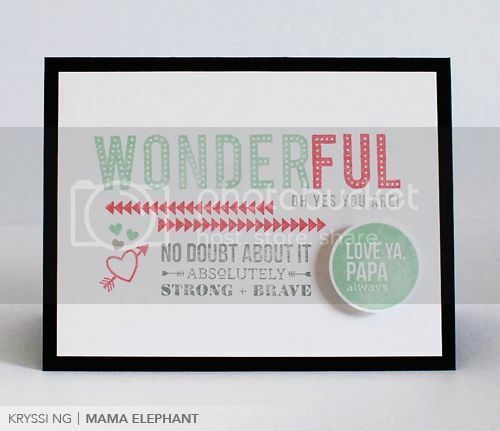 Our April release is now live and available for purchase in the store: www.mamaelephant.com. This month we are joined by THREE fabulous guest designers, Lisa Spangler, Elena Roussakis, and Pamela Ho! I'm sure they will knock your socks off with their creativity! To celebrate the new release, Mama Elephant is giving away 3 gift certificates worth $20.00 each to 3 lucky people! Winners will be chosen at random from the collective blogs in the Stampede. Winners will be announced on the blog on Friday, April 19th. Here's the blog hop list! I whipped up something really fun and quick using a variety of our stamps. And here's the full reveal of our April line up! Love these new stamps! Especially the little silhouettes in Tree Friends! Really cute sets! Love the Tree Friends! I am your blog follower! I love how you mixed and matched all the sets! Oh, the temptation! 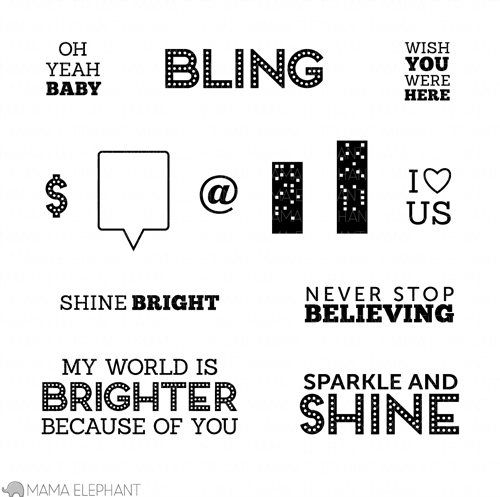 Love the new stamp sets ... especially Bling!. Already subscribe to your blog! flashy letters are my fav! love 'em! These are such cute stamps!! Love! Love your new release! These are fresh and different. Always love your new stamps! They're fantastic! I follow on Twitter and retweeted your new release! Love love love this release! tfs!!! I like you on FB!!! Great release, I especially like the dotted Flashy Letters. I am already a blog follower. Central Park is my favorite. I already "like" you on FB. I already follow you on Twitter. 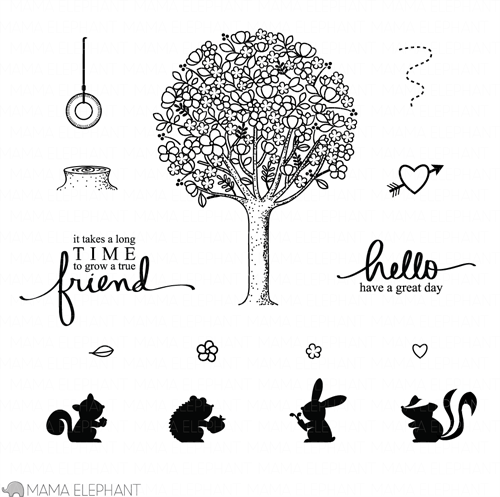 Love the new stamp sets, especially Tree Friends! Can't wait to see what the rest of the DT has in store for us. I am a subscriber to your blog! Love it! Oh I love these new sets! Especially the Tree Friends set! I also follow the blog! Loving the new Flashy Letters! Wonderful card. My favorite is the Tree Friends set. Fabulous stamp sets you have this release. I'm loving ALL of them although my absolute favorite is the Tree Friends set. Great features by DT. awesome release. love everything here. the tree friend is my fav of the month. Great new sets, and wonderful cards, can't wait to see what everyone made! I am in LOVE with both Flashy Letters and Bling...I honestly can't pick which one I like more. These sets are so unique and fun- fabulous job! Hi - love your blog! All of these new sets look FABULOUS, but I think my favorite is Tree Friends---so whimsical and sweet!!! My favorite set is the Central Park one--I particularly like the city background! I am a follower of your blog--naturally! I am a follower of the Mama Elephant blog!!! I just couldn't wait to get my hands on this release--it's fabulous! You keep outdoing yourself with each release! I am so impressed with this new release...and I would be thrilled to win! Thanks so much for a chance, and for the great video by Mariana! I am a follower of ME blog...thanks! I am also a follower on Facebook! My fave is "Tree Friends"...so CUTE!!! I love Central Park! It's so different and fun! I also already follow your blog! eek!! LOVING these new stamp sets!!!!! and the card you made is DIVINE!!!!!! love how you combined all of your stamp sets!! wow! All of the new sets are awesome! ME stamps are quickly becoming one of my favorites on my list! I am digging Central Park. These are amazing and each are so unique! LOVE them! Congrats on this release! I am a blog follower yay! And I'm a fb superfan! I am tied between bling and tree friends- so cute! My favourite from the release would be Bling. I've been a Fan on Facebook since I first heard about you. Likewise, I have been a fan of your blog since I heard of you too. Great stamps . I especially like the Tree Friends stamp. Love the Flashy Letters set. Thanks! Love this release! Off to hop! I'm already a follower here!! Tree Friends is so cute, and Bling looks like a lot of fun! Cute sets, I really like Bling. Cute stamps! I love the little animals, they're perfect! What an excellent stamp release, so many possibilities! Love, love, love Tree Friends and Flashy Letter! I already following the blog. And follow you on Twitter. I'm loving the Flashy letters. Following your blog. Great product! Tree Friends is easily my favorite set - LOVE all the critters! Thanks for the chance to win! Okay - these are FABULOUS!!! I love them all - but especially Central Park and Bling! I'm also already a blog follower!!! Loving Bling and Tree Friends! CUTE. :) I'm a blog follower too! Tree Friends! I love the images and the handwritten sentiments. I can see the tree watercolored for each season and those little animals are adorable. This set is going on my wish list! I became a follower here but, I have been following you on Pinterest for awhile. Please set up a board for Tree Friends! I had to come back and thank you for the wonderful hop! Fantastic samples! Great design team! Thank you for all the wonderful inspiration! I absolutely love the city skyline and horse and buggy. I love the Tree Friends set, it is gorgeous!! Absolutely love the detail on Tree Friends but i recently bought and got thru mail yesterday type it aaaaand im obsessed with it, such a cute idea!!! I think Bling is my favorite, but Central park is a close second. Thanks! Delightful new sets! Tree Friends is my favorite! Can't wait to see the samples on the hop! I already like ME on FB! I'm already a ME blog follower thru Google Reader! Forgot to say I shared too! I like Tree Friends the best. I can only choose one?!?! It's a toss up between Tree Friends and Hello. Although I like all three sets, I love the look of Tree Friends the most. Those animal silhouettes are so cute! Also, I follow this blog in an RSS reader.